The men and women of the 1916 Rising were dreamers, a romantic generation with an idealised vision of an Irish Republic. Their dream, that vision, has yet to be fully realised, not least in the disparity between “the haves” and “the have nots” in our society. The Government’s ‘Ireland 2016’ call is for commemorative actions that will inspire a new vision of Ireland, “releasing the creativity and imagination of our people”, “building a new legacy of hope, belief, possibility and confidence”. It is a call to re-envisage our future, to DREAM AGAIN. At some level this is a call to “the practical dreamers of Ireland” as Horace Plunkett described in 1894 the founders of the Irish Agricultural Organisation Society that gave us the Glanbias and Dairygolds of today. Dreams can be made real. One of the most resonant stories of the Easter Rising is of the heroic three day stand of 29 combatants at the Mendicity Institution, Usher’s Island, (adjacent to Guinness brewery on the south quays opposite Collins Barracks), under the command of 25 year old Sean Heuston, subsequently executed. The Mendo, as it’s called locally, is a charity providing meals to the indigent. 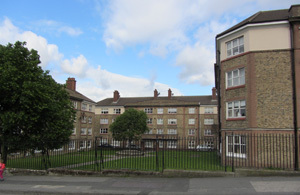 Once the grand Georgian Moira House, it was destroyed in the 1950s to make way for a two storey block leased today by the HSE, leaving an original workshop building, the boundary walls and entrance gates. 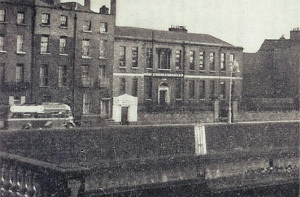 This battle site, dubbed Heuston’s Fort, is in one of Dublin’s most historic yet neglected quarters: the northern end of the Liberties between Thomas St. and the Liffey; Guinness and St. Audeons. The dominant occupants are the tenants of Oliver Bond and Emmet House council flats, the students of the National College of Art and Design, the workers in the Digital Hub, the many New Irish residing in the low-cost apartment block developments, and the traders of Thomas St. 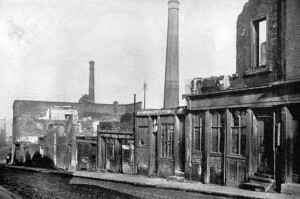 The area is blighted by derelict sites, social deprivation, drug usage, economic disadvantage and cultural poverty yet its people retain a strong sense of place and community, and a yearning for an improved identity and life conditions, as evidenced by the resilience and determination of its local community support groups. Ireland’s Centenary is the time to re-imagine this part of central Dublin. It’s time to start dreaming again.